Over 150 Syrian refugees who have settled in Canada have just been given their first dental consultation since emigrating from overseas – and it was 100% free of charge. 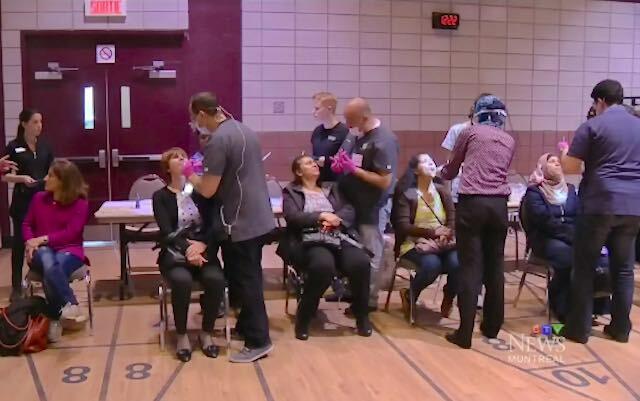 Roughly 30 different Montreal dentists and hygienists in Ville Saint-Laurent offered up their services this weekend to all of the Syrians who have been unable to afford a dental check-up since their arrival to the country. In addition to the weekend’s dental work, any refugees who require a follow-up visit will not be charged when they return. The session was spearheaded by Syrian orthodontist Dr. Ayan Chamma in collaboration with the Red Cross and volunteers from John Abbott College. Dr. Ayan instigated the event as a means of helping his native people who have struggled in adjusting to Canadian citizenship since their emigration. Judging by the sparkling smiles on the visitors’ faces, however, he accomplished that goal spectacularly.